Hey everyone! It’s Maite, and for my last blog post I am talking about failure. This year in PLTW I, and my fellow students, all learned about failure. Not only how it happens a lot, but that it is okay. Failure is something that happens all the time and something that shapes us to always do better the next time. One time I experienced failure this year was while doing my maker project. My group and I worked very hard on the making of the project but we faced quite a few challenges and there were times where what we did, did not work. On the day of the maker faire one part of our project barely worked, and at first I was pretty upset. But I realized that the part that did work was really good and that even though that one part did not work, we worked very hard on it and that was what counted. We put so much effort into it and it taught us what we did wrong and what to do better next time. So, whenever any us face something difficult and we fail, we always must remember to get back up and try again and be proud of all the effort we put into it. Have a good one everybody! Is the second semester of 8th grade, my group and I have been working on different projects throughout the year. It has been the best of PLTW, better than before, because it really was an impact to us, students, are finally making a difference. We’re showing how amazing we can be in any way. Either we showed our talents by media tech ideas. I can’t remember any media tech projects that we have done, but I do remember that we made a video showing our ideas of some sort of new invention, but I’ve heard, people have made cameras. Students also worked on engineering modules that could help create and think of new ideas to build stuff in the future. Finally, in the biomedical field. I got the chance to work on making a prosthetic leg, it could help a life some day, thanks to future inspirations (like us:). This time were working on something inspiring, more of a engineering project. Sadly, is our last fun project that we’ll do in PLTW class. My group and I are working on a rad skateboard. That’s our project; building a skateboard. Our theme is Hawaiian and surfing. This came out to be because of how we loved the design of the skateboard. It looks like a surf board. And we had all these ideas of how it would be like since it looks like a board meant to be in the water. When we heard we were gonna have to sell it afterwards, I was heartbroken. Working on something amazing, and useful but having to sell it for others to have, wasn’t my idea for a perfect project. I moved on, and now I’m glad that we’re giving it away for someone who would absolutely love it and would use it everyday. Plus, you feel amazed that someone really did want it for themselves. I remember times when I struggle a lot and feel like I should give up and move to the next thing. But you need to know that you can do it, just because you’re negative, you won’t be able to accomplish anything. I don’t remember any specific hard moments I just felt like I should just stop and give up, but I remember some time, around this week, that I was struggling and I wanted to give up. It was with algebra homework. I re-read the question over and over again, but nothing. I try to see what I’m trying to look for, but nothing. So I thought, “I give up.” I moved that aside and started doing my other homework to get that through, and maybe, I would’ve returned to that difficult task. And so I did; I went back and looked at the question, I re-read it until I can get some ideas of how to solve it. Finally I got it, I had to make the question into an equation. I’ve done that before, it was in the notes. But I was just glad I didn’t just let it go. We have to check back and try hard to get the answer/solution. I got that through with. But that was just one time and it was not too long ago. We all feel like giving up at some point. And we have, but you can always stop. Stop thinking of negativity of how badly you’re gonna fail, as long as you do your best is all good. My group and I, got the news that someone bought our skateboard, very shocked we were. Going back to the main idea of the project, it was to see how failure happens, but don’t give up. 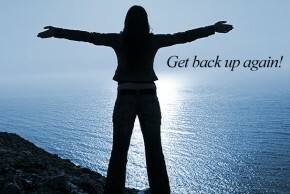 Just like skateboarders, once they fall, they get back up. They don’t throw their skateboards away and say “I won’t skateboard again. I give up!” Now that someone owns our skateboard, they would have the opportunity to modify it and make it into a riding skateboard, they can know the feeling of giving up and failure. But it depends on that person, if they wanna get back up and ride one last time, in the cruiser. This six weeks, everyone in the 8th grade is doing a project that involves making a skateboard for the rest of the year. 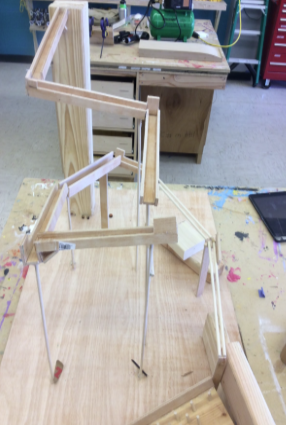 I would have liked to do that project because it sounds like fun to make a skateboard, but I also wanted to continue working on a playhouse that my group members and I have started a while ago. We started working on it before spring break and we are almost done with making the whole house. Right now, we have mostly finished painting the house (we just need some minor details to add) and afterwards, hopefully we get to decorate the inside of the house and deliver it to Jocelyn Elementary school. We also need to add some molding hopefully, in places that it needs them. It needs them in the bottom and some on the roof of the house. I am really excited to take the playhouse to the elementary school and give it to the little children to play in. I have heard that they are excited to have the house finally because they have been waiting for some months now. The playhouse was actually not as easy as I thought it would be to design, build, and paint it. It was a bit hard and we needed to move the house about 3-4 times, and that was not easy at all. We had to have at least 7 people help us(the house is 5×6 feet) because it is pretty big. It was hard but at the end it was worth to do all that work for the little kids. To Quit or Not to Quit By Izabella M.
If I had to write a book about the Make-o-Rama, I think I’d have to go with the title: “The First Annual ARS Make-o-Rama 2015- The Spectacular Event That Instilled Both Stress and Excitement Within Me- A Memoir.” Okay, so maybe I would have to shorten that, but there’s most definitely a truth to it. To give a quick summary as to what exactly this so-called “Make-o-Rama” is- Make-o-Rama is an event that took place at the end of April 2015 at the Ann Richards School that allowed us students to display our projects we had been working on in PLTW for the past couple of months to our fellow peers. I know, I know, this sounds super cool, and it’s not that I was worried it wouldn’t be. However, I was concerned because the Make-o-Rama was fast approaching, and to say the least, our project was utterly failing. This is where the stress comes in. We were constructing a marble run, intending to make it out of wood and pieces created by the marvelous 3D printer with the idea that our project would represent how even the oldest, simplest of designs, can be combined with modernized design techniques. I actually got really into it and grew excited as we 3D printed a few pieces to add to our track. However, we then realized that the Make-o-Rama was only a week away, and we couldn’t find a way to properly attach the 3D pieces and contemplated giving up. After agonizing over it, we ultimately decided to scrap the 3D printed pieces (much to my disappointment) due to the ticking clock. I felt like a complete failure. I mean, we’d completely given up on such an inspiring idea because we couldn’t fathom a way to fix our problem. Wouldn’t that be considered a failure? 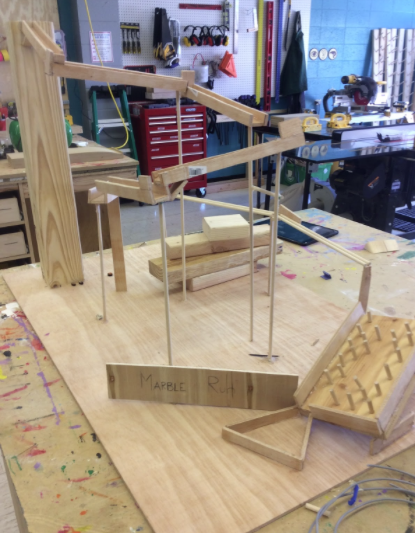 What I came to realize through our marble run project is that just because something doesn’t go as originally planned, it doesn’t mean it is a failure. Tons of inventions were created by accident, such as the microwave, velcro, and even popsicles! Beautiful and useful things can emerge from a “failure.” After all, our marble run turned out great, with neatly cut pieces, cool track extensions- all without the 3D printed pieces. Though in this situation we gave up on our 3D printing idea, we knew it was for the best, and our finished product is evidence that it was. Weare officially done with our skateboards! We have all worked so hard designing and creating our skateboards. We went threw designing, creating, and building. Me and my group made a skateboard that related to Texas. The base color is lavender, and on top we have little green succulents, with the bases black & white with different designs. This project was really fun.